As a mom and personal finance blogger, I get the opportunity to review many books. 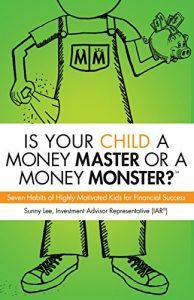 One that I just reviewed that I can’t recommend highly enough is Sunny Lee’s book, Is Your Child a Money Master or a Money Monster? Money Master or Money Monster? Sunny Lee is a financial advisor, and she has taken the time to teach her twin sons about money. In fact, her strategy has worked so well that she’s sharing all her techniques in this book. Lee has a variety of strategies for teaching kids about money in a fun, incentive-filled way. Offer rewards. Lee’s strategy of offering her children rewards helps shape their behavior in a positive direction. For instance, when her sons were in 1st grade, Lee developed the Morning Stuff Allowance Project. Each morning, her kids had to get up when their alarms went off, tidy their rooms, get dressed, pack their backpacks, and make and eat their own breakfast and get to school on time. If they did this every day, they earned $3 a week. While the kids were motivated by the money, they were also unknowingly developing skills that would help them through the rest of their lives. Even better, Lee didn’t have to fight with her boys in the morning to get up and get their chores done. Everyone in her household could enjoy a more peaceful morning. Play games. As the boys got older, part of Lee’s strategy to teach them about money was to give them a safe place to experiment. She did this by finding a variety of free, money based games online. Her boys experimented online with running a coffee shop. They had to decide when to discount their coffee based on the season, how much inventory to buy, etc. Try out your skills in the real world. Finally, Lee let her sons experiment and try their money skills in the real world. An important component of this was to let them fail in small ways. One son spent a large sum of money on a hat, which he loved, but then he didn’t have money available for a while after that. Her other son learned from his brother and bought a hat at a discounted market so he wouldn’t use all of his money on one item. Lee’s book contains seven strategies to teach your kids about money (and as a byproduct, teach them personal responsibility). One thing I loved about the book and her strategy is that she keeps adding layers to her plan. For instance, after her kids mastered the Morning Stuff Allowance Project, that remained in place, but Lee added on the Special Incentive Project. If her boys chose to, they could earn additional money throughout the week by completing a book report, doing an art project, etc. Again, she helped her children grow academically and artistically through an incentive. I highly recommend this book to anyone looking to not only give their children a strong financial footing, but also a strong work ethic. Have you read this book? What is your favorite book to teach kids about money? Often, teens want to make money without the commitment of a part-time job that may require them to work more hours than they can handle while also attending school and keeping up with homework. Or, they may want to work for themselves, doing what they love or participating in sports, doing schoolwork, and searching for scholarships. There are many reasons why a teen may not want a traditional part-time job as a cashier or a fast food employee. Historically, these types of kids would rely on babysitting or lawn mowing jobs. If they were particularly resourceful, they may try to start their own Etsy store. However, the time to start an Etsy store, market it, create products, maintain customer relations, and ship out items can be intense. Many teens don’t have time for that. Luckily, teens can now use the power of social media to grow their own business and make money quickly on the timeline they set. For instance, a young woman in our homeschool group needed to raise $2,000 for an upcoming mission trip she wanted to attend. She offered to make cinnamon rolls ($20 for a 9×13 pan) and fudge ($8/lb.) for Valentine’s Day. She shared on her own Facebook page, and her mom shared on her Facebook page. Their family and friends quickly responded by placing orders over the next week. Within two weeks, she had made the money that she needed, and she had happy customers who had homemade sweet treats for Valentine’s Day. Another teen in our group makes balloon animals. She offered to make balloon flamingos attached to a container of chocolate for Valentine’s Day for $8. She got over 25 orders and made a nice profit. Recently, her mom set up a Facebook business page for her daughter to promote her business. This young lady, who is still not even in high school, routinely is hired to make balloons at children’s birthday parties. Now she has a page to promote her work by showing the balloon styles she can make and showing examples of what she does at parties. This job can grow into a nice part-time income, especially when she is in high school and college. 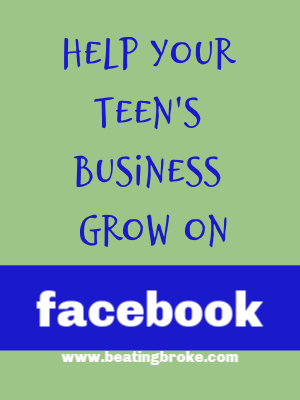 While Facebook may be a great way for teens to start their business, it also gives them much needed exposure. For instance, when the young lady above is working at a birthday party for a friend her mom has on Facebook, other moms at the party will ask about her services. These women have no connection to her or her mom, but the magic of word-of-mouth referrals has begun. Between Facebook and word-of-mouth referrals, she will likely keep very busy. We’ve all heard the stories of teens who become YouTube celebrities and make thousands of dollars. That likely won’t happen with the majority of kids. However, thanks to social media, your child can grow a nice part-time business, especially if they advertise a product or skill that people want to their and their parents’ Facebook page, where people already know and trust them. Do you have an entrepreneurial teenager? If so, how do you help support their endeavors? How do they usually find their clients? Summertime is here, and if your kids aren’t already out of school, they will be soon. Summer is the perfect time to make memories with your kids, but if your plans include the local theme park, shopping at the mall, and meals out, plan to spend a lot of money entertaining the kids. While you can enjoy summer that way, there are plenty of ways to enjoy the summer without spending a lot of money. Pack some sandwiches, chips and some fruit, and take a drive out of town. Find a nice, rustic place to have a picnic and spend the afternoon. Kids will appreciate the adventure and change of scenery. Several movie theaters, including Harkins and Regal, offer discounted movies for kids during the summer. For 10 weeks, my kids and I go to Harkins theaters once a week to see a movie. The best part? We buy a pass for each of us for $5 apiece. Yep, if you see all ten movies throughout the summer, you pay just .50 a movie. The four of us can see a movie for $2 total every week. Can’t beat that. Many cities offer free evening concerts and movie showings. Just check out the happenings in your town every weekend. You may be surprised how many free events you can find. There is also a summer bowling program, Kids Bowl Free, that you can sign up for. While the bowling is free, you do have to pay for shoe rental. Every week, our local library has at least one free program for kids. This week, my son will be taking a one hour art class. Next week, my daughters will be taking a free science class where they will be erupting mini-volcanoes. While you’re there, don’t forget to check out a few books, DVDs, and CDs. If your kids want the adventure of camping but you don’t want to pay the camp site fee, why not camp in the backyard? Kids get the adventure, and if they get scared during the night, the house is only a few steps away. Is there anything better than visiting the beach on a hot summer day? Bring your sun screen and a lunch and spend the whole day playing in the water, reading a book, and getting a tan. Feeling nostalgic? Why not watch the Star Wars movies with your kids or the Back to the Future trilogy? Watch a movie a night until you finish. Enjoy popcorn and reminiscing about watching these movies in your own childhood. Summer can be expensive, but it doesn’t have to if you know where to look to find free and cheap activities to keep the kids entertained. What are your favorite free or cheap activities to do with the kids during the summer?